In an earlier post, I discussed the way in which Modern Monetary Theorists conceptualize the value of the currency. In this context, ‘value of the currency’ refers to its domestic value, not exchange rates. This value is defined in MMT as whatever must be done to obtain a unit of the currency. It can be defined in terms of minimum-wage or ‘simple’ labor time. A minimum wage of $10 would imply that it takes 6 minutes of simple labor time to obtain a dollar, expressed as 6 minutes/dollar or 0.1hrs/dollar. A recent post, which considers the idea further, makes brief mention of the connection between currency value, inflation, and distribution. Here, I want to elaborate on that connection. In this identity, P is the general price level. The stars in the expression indicate that the terms refer to growth rates or rates of change of the variables involved. (Usually dots rather than stars would be used.) Rising productivity makes it possible to produce more real output for given employment, putting downward pressure on prices, whereas attempts by firms or workers to boost their nominal income exert upward pressure on prices. We can view the same relationship in terms of currency value. 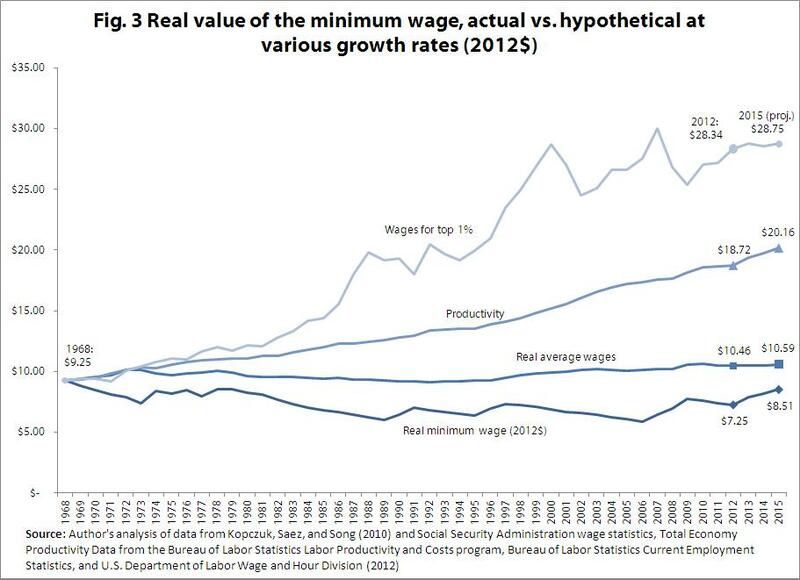 Since, in MMT, this value is defined as the amount of labor time required to obtain a dollar of wages, an increase in nominal wages implies a decline in the value of the currency. The identity suggests that a decline in the value of the currency (a rise in nominal wages) will be associated with inflation unless productivity improves rapidly enough to offset both this decline in currency value and any widening of the markup. It is also possible to relate all this to real wages and income distribution. Suppose that money wages, and therefore the value of the currency, remain constant. What will happen to real wages and income distribution? The effect on real wages, w/P, and income distribution will clearly depend on what happens to prices while money wages remain stable. In turn, what happens to prices will depend on what happens with the markup and productivity. To keep things simple, assume that employment remains stable as productivity is improving, perhaps because the government conducts fiscal policy to this end. On this assumption, advances in productivity will translate into higher real income, Y, irrespective of what is happening to prices and nominal income, PY. (A) If the markup increases precisely in line with productivity (k* = APL*), the price level will remain steady (P* = 0), and so too will real wages. All the real gains made possible by higher productivity will go to profits. Capitalists will have a greater share of a higher real income. Workers’ absolute living standards will remain constant, but their share in real income will decrease. (B) If the markup is increased more rapidly than productivity (k* > APL*), there will be inflation (P* > 0) and a fall in real wages. Not only will the real gains from productivity be entirely captured by capitalists but the reduction in real wages will leave workers with a lower absolute living standard. (C) If the markup is increased less rapidly than productivity (k* < APL*), there will be deflation (P* < 0) and an increase in real wages. Since productivity is improving, but the markup increases by less than productivity, both workers and capitalists will share in the real gains. (D) If the markup remains constant while productivity improves (k* = 0 < APL*), both money wages and the markup will be constant as prices fall (P* < 0). Workers will enjoy an increase in real wages and share equally in the real gains made possible by productivity improvements. Notice that all these scenarios are possible even though the value of the currency has been assumed to remain constant. To say more, it is necessary to make behavioral assumptions about causation and specify in more detail the institutional context. In the MMT view, a job-guarantee program, offering a minimum-wage job to anyone who wanted one, would provide a nominal price anchor for the broader economy and, in conjunction with generalized fiscal policy, tend to keep inflation under control. By restricting changes in the job-guarantee wage to those that reflect changes in productivity, the job guarantee in itself would not be inflationary. By defining the minimum wage, it would provide a floor under other wages, and also a floor under demand during downturns. In the broader economy, both wage demands and the markup would be subject to the influence of generalized fiscal policy. In a period of excessive demand, fiscal tightening would constrain wages by altering the ratio of job-guarantee employment to other employment. The markup would be similarly constrained by fiscal tightening because total profit, as demonstrated by Kalecki’s profit equation, is a function of demand. By keeping the rate of decline in the currency value (or rate of increase in money wages) in line with the growth rate of productivity, inflation will tend to remain low and stable. Here, P is the general price level, Q is real output, and Y is real income. Be careful here. The term ‘productivity’ is loaded. What that equation says is that you create more real output for a given amount of *simple labour hours*. That is very easy if a great many of those simple labour hours are currently ‘on the bench’ – representing the internal buffer stock that all businesses maintain. So I would suggest that ‘productivity’ depends upon the strength of the effective demand as well as the usual technical factors transforming labour hours into labour services. Half the problem with analysis of these economic equations is that they seem to assume the entire stock is fully deployed at any point in time. You get the same with the quantity theory of money. MV is all very well, but not all the M is generating the V to give you the turnover. Similarly here not all the simple labour hours are necessarily generating real output – particularly in a depressed economy. With that caveat on the nature of ‘productivity’, great post. Yep. Good point. I agree entirely. As you probably guessed, this is why I assumed for simplicity that “employment remains stable as productivity is improving, perhaps because the government conducts fiscal policy to this end.” This assumption is patently unrealistic under present policy practices. I just wanted to keep the various cases I considered tractable, but reality is definitely more complicated. It’s a good thing you drew explicit attention to it in your comment, because the point is probably not as clear as it should have been in the post. *Politicians need bouncing on their heads until they begin to see daylight and step up to their real and above all human responsibilities! *The answer in Europe is to dip the Govt. hand into peoples savings to momentarily feed and placate the dinasours in lieu of human sacrifice ???? For me, the reality is that in every human heart there is peace! No less because it substands every atom in the known universe and beyond. The buddhists call intellect the ‘clear cold blue light’ but it exists tied to the glow of human passion. If it drifts off on its own it becomes withered, corrupted and dies. There is also another light within a human being we call the heart. That is where I believe we will find our answers and when we do, the ‘clear cold blue light’ will have something to warm it, and make sense of this existence. Because the above description of the economy (subject to its accuracy) is something out of a keystone cops episode. It’s a horrible joke! A human miasma, fiasco and disaster. It is thick stupidity! I don’t know how economists can sleep soundly, or rest at night? Politicians we know are characteristically attention deficient idiots – media tarts full of it. But where is justice; where the lawyers???? At least the scientists are doing their bit; but this is what I mean about the ‘clear cold blue light’ – it is not enough. It takes a whole human being to integrate all of these things inside of themself and I am certain that no less will do. Knowledge is meaningless without knowledge of the self. That to me is our human bottom line. Am not talking about the self that swims around in the ‘clear cold blue light’ playing in the spotlight. Am talking about the self that dwells within each heart. It is the only one in our belated human existence that has the potential within it, to turn the miasma into a delightful play. I have never ever met anything else in this life that has this power! Very nice use of identities. I ‘d take the analysis a bit sideways in order to show how inflation targeting can result in zero output gaps only under restricted assumptions. An inflation targeting central bank will try to keep inflation equal to the expected (which should be anchored to its long-term target inflation rate, say 2%). In that case, a zero output gap (u = u*) will only be achieved if k = APL. If k > APL then u > u* while if k < APL then u APL) will find out that inflation targeting works to its benefit since it increases unemployment and lowers labor bargaining power. Nice work, Kostas. I especially like your observation that inflation targeting combined with easy credit can have long-term redistributional effects. Very interesting analysis, although I have a minor quibble: (D), it seems to me, is no more than a particular case of (C). This in principle reminds me of how the payoffs of the two opposing players in a zero-sum game relate to each other. But before going too far, I’d like to ask about the causality: the algebraic derivation above, unfortunately, doesn’t mention causality. Don’t get me wrong, intuitively it seems to me k* and w* clearly should be considered causes of inflation. What is not clear to me is the role APL plays. So, I was wondering, could you elaborate on this? There is a final observation (probably just another quibble, but it does trouble me, nonetheless): are we sure we can call k a markup? [*] Perhaps this is a variation on the scenario proposed by Kostas Kalevras. Good question regarding causation. I deliberately didn’t say much about it in the post because it is no doubt complex. The following is little more than thinking aloud. One way of looking at it might be this. When firms decide on investment orders (I am not saying the economy is necessarily investment led, see below), they will make their outlays drawing on lines of credit. The workers who receive the wages will spend much of them on consumption items. Output in these branches of production will adjust to the demand, which will also require payment of wages. The amount of the aggregate markup will depend on the level of production in investment goods and capitalist consumption items. The wage demands that can be granted and the markup achievable will depend on the willingness of banks to grant the necessary loans. If demand conditions and profitability are strong, banks will have a strong incentive to grant the loans, and the ‘money supply’ will increase endogenously to enable the wage payments and markup. I am somewhat agnostic on whether the process is investment led or consumption led, but in thinking about productivity I probably lean more to the view that, in the longer term, non-capacity creating autonomous demand (e.g. government consumption expenditure and autonomous private consumption expenditure) tend to drag the economy forward if they are sufficiently strong relative to productive capacity. I think this for two reasons. First, if autonomous demand is persistently strong such that firms are operating at higher than normal capacity utilization, they will be enticed to expand capacity. to restore a more normal degree of utilization that gives them room for maneuver when responding to fluctuating demand. Second, when demand is strong, unemployment will tend to be low and organized labor relatively empowered, which creates a strong incentive for firms to innovate to raise productivity and create temporary, technological unemployment. So, putting these considerations together, if output and employment are growing strongly, due to persistently strong non-capacity generating autonomous demand, endogenous money will mean that workers are more likely to win wage increases and firms more able to increase the markup, both of which tend to put upward pressure on prices. However, at the same time, there will be an impetus for firms to save on labor costs through innovation, and this will boost productivity and restrain inflationary pressures. In other words, during a period of economic growth, APL* would result from positive k*: in order to maximize w*, capitalists would try to save on labor costs through innovation. And this would also lower inflation. from a post by David Ruccio to RWER blog: “US wages and productivity 1968 – 2012 (minimum, average and The 1%)”. If you see the chart, since 1968 productivity has increased almost constantly, until about 1995, when it sped up a bit further. By comparison, US minimum wage was falling until 1990 and by 2012, after a slight recovery, it still is lower than in 1968 in real terms. Real average wages remained either static or tending to fall until about 1996, when they sort of started moving up. being W real wages, and U profits. If I am not mistaken, k – 1 is Marx’s exploitation (or surplus value) rate: surplus value over variable capital… The larger it is, the larger the profit relative to wages. Good comment, Magpie. I don’t want to defend my position too enthusiastically because, as I mentioned, it was mainly just thinking aloud. I will just clarify a couple of things. I’m not saying wages have grown relative to productivity. Clearly the reverse has been true throughout the neoliberal period. In the passage you quoted, I was saying that if demand and growth were strong — which they haven’t been over much of the neoliberal period — inflationary pressures would tend to be mitigated by innovation that improves productivity. Kliman states in an old post (scroll down to bottom of page) that the average rate of growth in world GDP over the neoliberal period from 1974-2003 (so not even including the current crisis) has been about half that of the preceding postwar period. Excluding China, it has been about one-third of the postwar growth rate. Neoliberalism has been a period of austerity in which high unemployment is used to suppress wages growth. This leaves more room for non-inflationary increases in the markup. Even in the period of relatively strong neoliberal growth, fueled by private-credit expansion, we know that the private debt was not being used primarily to pay higher wages, so again there was space for non-inflationary attempts at increasing the aggregate markup. Maybe you are questioning the impetus in a full-employment economy toward productivity improvements, given that there has been productivity improvements in recent decades? My understanding is that productivity growth from the mid-1970s till 1995 was only about half of what it had been during the postwar period. It picked up after 1995, which was a high-employment period, albeit fueled by private credit expansion in a context of austerity. A quick google search came up with this paper. I haven’t read it but simply scanned the tables of p.12 which compare productivity growth under alternative measures over different periods. I really need to start writing stuff **before** I am so sleepy/tired I make no sense. And, as usual, this is what happened this time. My capitalists (as “explained” in my previous post) are really generous! I interpret David Ruccio’s data as saying that a positive APL* may “provide room” for both a positive w* and a positive k*, but the definitive outcome is not determined by APL*. In other words, productivity is not necessarily forced upon capitalists by increasing real wages.